Refer a Friend get a FREE book. New stuff out on the $1.00 carts. Organized and sorted the Cookbooks. Adam Collings California West of the West signing went ok, there were very few who stopped in, but they had a long interesting discussion about the book, then Adam was off running to Santa Barbara for another event. Two Signed copies of Adam Collings California West of the West are available. Forgot to get photos again, drat. Stayed late listing some RPGs, SF, & Magazines. 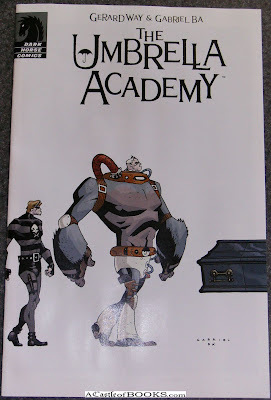 Received the Umbrella Academy Alternate Cover #1 that I won from Dark Horse. Cool! Priced/shelved 8 boxes of paperbacks, lots of Fiction, Romance, some Young Adult, Fantasy, Science Fiction, Mystery, Self Help, and more. Umbrella Academy Alternate Cover Giveaway! The first person to bring a print-out of this blog post into the store, and make a purchase (of anything) will get a FREE copy of The Umbrella Academy Alternate Cover #1 shown below. Yes you have to come into the store, sorry. If it will be too much of a drive, call ahead and see if it's still available. - nevermind it's not available any longer - but you can still purchase a copy Online or instore while they last! Priced/Shelved/Listed the Role Playing Game books from yesterday. Chuck stopped by the check out the AC, and gave it his ok, just not quite powerful enough for the heat wave the other day. Online Sales out, RPGs in. Packed the orders from the weekend. Scheduled USPS pickup for tomorrow. Paid bills, and did the Diamond order. Traded in today, box of RPGs, some comics, nursing/EMT textbooks. Didn't get much done, but there are a couple of orders online so that's starting well. Well the Jeffery Scott signing had a rather small turnout, and Jeffery was not doing well himself, with some dental problems, so we ended at 5:00. and I forgot to take pictures gah! Signed Limited Hardcover of Visions From Within the Mechanism: The Industrial Surrealism of Jeffery Scott (1019) is available. Listed/Shelved more stuff from behind the counter. 2 boxes of mostly art books ordered new arrived. The Roof, the roof, the roof is ... got a big hole in it. Supposedly they're fixing the roof so it won't leak with the rain forecast for tonight, people stomping around up there all day. Priced/shelved 4 or 5 stacks of hardcover, mystery, fiction, military. Diamond Comics shipment arrived. Invader Zim Figures, Gerhard Way's Umbrella Academy #1 just released. Every pirate lives for something different. For some, it's the open sea. For others (the masochists), it's the food. For you, it's definitely the fighting. You tend to blend into the background occaisionally, but that's okay, because it's much easier to sneak up on people and disembowel them that way. Arr! Finished signing up for Biblio.com, and signed up for Amazon.com pro merchant account. Sent half the bulk emails for the Jeffery Scott 1019 signing coming up on Saturday. Listed/shelved about a half shelf of stuff behind the counter. Jury duty wasn't too bad, finished and back to work just after 4. Sent emails for the Jeffery Scott 1019 signing on Saturday 22nd. Brief tribute by David Drake. Priced/Shelved most of the Rolling Stone magazines from 2000 to 2007 $2.95 each. Shelved/Listed some books, Brainwashing, Queen's Own, Pianists. Put up some book cartoon clippings. Traded for a large collection of Rolling Stone Magazines 1994-2006. Dan & Kathy stopped by to trade in some books. Shelved/listed a collection of Signed T. Jefferson Parker books, among others. Installed speakers for the computer. Put archival plastic dustjacket protectors on a bunch of rare & signed books. Listed a half shelf of signed mystery books. Marked down some mystery hardcovers to $3.95. Lots of calls with people wanting to sell their books. Several inquires about jobs, too bad I can't afford to hire anyone for the time being. Shelve the stacks from the trade counter, list a few. Messed about with speakers for the computer. Shelved 3 boxes of series romances in the $1 section. Cleared more shelves in the 3rd cubby. Put together another rolling $1 bookrack for outside. Shelved and Listed some Microbiology books, rare kids book. Purchased a collection of Military, Aircraft, WWII, and Mushrooms books. And reread Hamilton's Guilty Pleasures. Shelved 3 boxes paperbacks, there's some new/popular stuff on the spin racks. Ordered more stamps for pricing paperbacks. Renewed Auto Insurance, worked on finances in the morning. Young man came by and dropped off a sports car load of fiction & adventure hardcover books, referred over from Once Read Books. Priced & shelved some oversized books, listed a few. Found a nice Quilting book. Shelved a few collectable paperbacks. E-mail, snail mail & web'd press releases for the Adam Collings - California : West of the West book signing Sept 29th. Ordered ink refill kit for the printer. Ordered around 20 new books, mostly Art with a few History, and Snakes. Shelved and listed some oversize books. This is the original Museum exhibition book that accompanied the International Center of Photography exhibition of original Edward Kelty photographs in New York from September 13 through December 1, 2002. There is a very slight corner bump at the top, and very minor wear to the dj.